Whitney Phillips was born and raised in Jackson County. She is a 2004 graduate of Section High School. She received an academic scholarship to Northeast Alabama Community College and then transferred to Athens State University where she received a Bachelor of Science degree in Accounting. 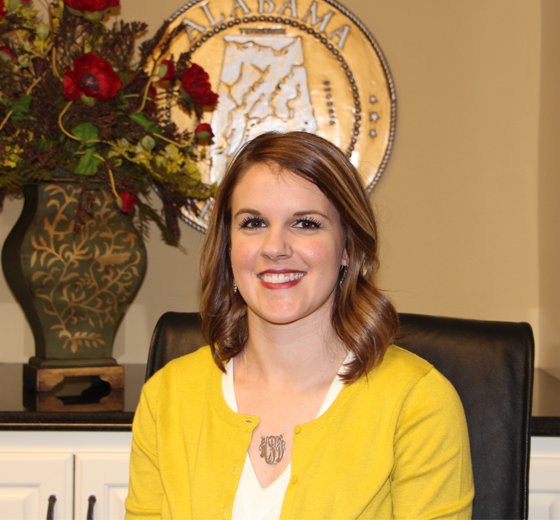 She began her career for the City of Scottsboro in January 2008 as the Accounting Assistant and then promoted to Staff Accountant after receiving her degree. Whitney was then promoted to City Clerk in June 2013. The goal of the City Clerk is to efficiently hold City Elections, perform record keeping functions related to City Council meetings, maintain copies of Municipal Resolutions and Ordinances passed by the Scottsboro City Council, and provide services to the citizens of Scottsboro, elected officials, and other City Departments in a professional and timely manner. The City Clerk maintains records of all ordinances for the City of Scottsboro. The Clerk’s Office will be happy to provide copies of ordinances passed by the Scottsboro City Council. Copy fees are as follows: up to first 10 pages $5.00, after 10 pages $.25 per each additional page. Please contact Whitney Phillips 256-912-0502 for more information. The City Clerk maintains records of all resolutions for the City of Scottsboro. The Clerk’s Office will be happy to provide copies of resolutions passed by the Scottsboro City Council. Copy fees are as follows: up to first 10 pages $5.00, after 10 pages $.25 per each additional page. Please contact Whitney Phillips 256-912-0502 for more information. It's the City Clerks responsibility, to maintain all minutes of City Council meetings. These minutes are then archived and also listed on the City of Scottsboro website. You can view minutes for the City of Scottsboro Council meeting here.